Version info: Code for this page was tested in IBM SPSS 20. A researcher has collected data on three psychological variables, four academic variables (standardized test scores) and gender for 600 college freshman. She is interested in how the set of psychological variables relates to the academic variables and gender. In particular, the researcher is interested in how many dimensions are necessary to understand the association between the two sets of variables. Example 2. A researcher is interested in exploring associations among factors from two multidimensional personality tests, the MMPI and the NEO. She is interested in what dimensions are common between the tests and how much variance is shared between them. She is specifically interested in finding whether the neuroticism dimension from the NEO can account for a substantial amount of shared variance between the two tests..
We have included the data file, which can be obtained by clicking on mmreg.sav. The dataset has 600 observations on eight variables. The psychological variables are locus of control, self-concept and motivation. The academic variables are standardized tests in reading, writing, math and science. 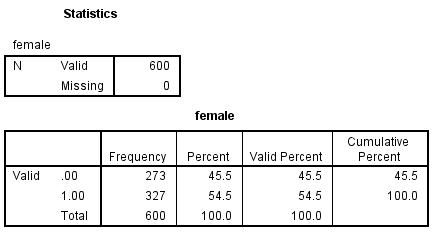 Additionally, the variable female is a zero-one indicator variable with the one indicating a female student. 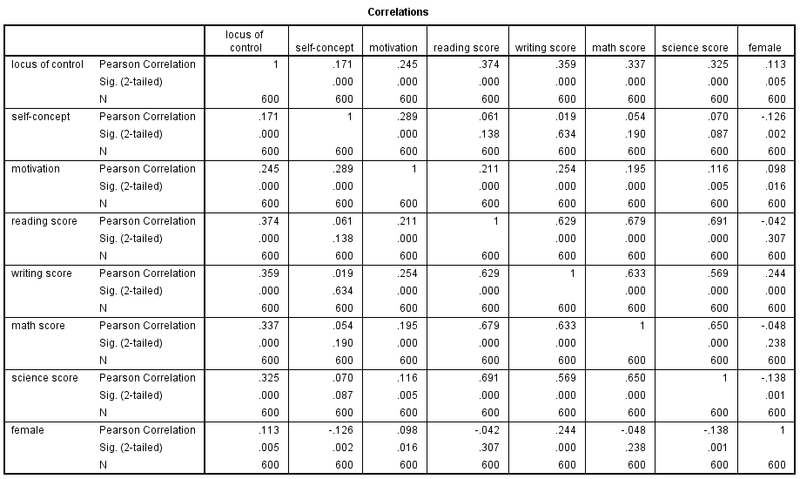 Here are the correlations among the variables in the analysis. /variables=locus_of_control self_concept motivation read write math science female. SPSS performs canonical correlation using the manova command. Don’t look for manova in the point-and-click analysis menu, its not there. The manova command is one of SPSS’s hidden gems that is often overlooked. Used with the discrim option, manova will compute the canonical correlation analysis. The number of possible canonical variates, also known as canonical dimensions, is equal to the number of variables in the smaller set (the variables to the left of "WITH" in this example, called "DEPENDENT variables" in SPSS output). In our example, the first set has three variables and the second set has five (called "COVARIATES" in SPSS output). This leads to three possible canonical variates for each set, which corresponds to the three columns for each set and three canonical correlation coefficients in the output. Canonical dimensions are latent variables that are analogous to factors obtained in factor analysis, except that canonical variates also maximize the correlation between the two sets of variables. In general, not all the canonical dimensions will be statistically significant. A significant dimension corresponds to a significant canonical correlation and vice versa. The output below begins with an overall multivariate test of the entire model using four different multivariate criteria. This is followed by the three canonical correlations and the multivariate tests of each of the dimensions. These results show that the first two of the three canonical correlations are statistically significant at the .05 level. WITHIN+RESIDUAL. Note that these are the same for all full factorial designs. Here we have the overall multivariate tests for dimensionality. We also have the canonical correlations as well how much variance of the dependent variables is explained by the dimensions. For this particular model there are three canonical dimensions of which only the first two are statistically significant. The first test of dimensions tests whether all three dimensions combined are significant (they are), the next test tests whether dimensions 2 and 3 combined are significant (they are). Finally, the last test tests whether dimension 3, by itself, is significant (it is not). Therefore dimensions 1 and 2 must each be significant. Univariate F-tests with (5,594) D. F.
The raw canonical coefficients above are used to generate the canonical variates, represented by the columns (1 2 3) in the coefficient tables, for each set. They are interpreted in a manner analogous to interpreting regression coefficients i.e., for the variable read, a one unit increase in reading leads to a .0446 increase in the first canonical variate of the COVARIATE set when all of the other variables are held constant. Here is another example: being female leads to a .6321 increase in the dimension 1 for the COVARIATE set with the other predictors held constant. The raw canonical coefficients are interpreted in a manner analogous to interpreting regression coefficients i.e., for the variable read, a one unit increase in reading leads to a .0446 increase in the first canonical variate of set 2 when all of the other variables are held constant. Here is another example: being female leads to a .6321 increase in the dimension 1 for set 2 with the other predictors held constant. When the variables in the model have very different standard deviations, the standardized coefficients allow for easier comparisons among the variables. The raw canonical coefficients are followed by the standardized canonical coefficients. The standardized canonical coefficients are interpreted in a manner analogous to interpreting standardized regression coefficients. For example, consider the variable read, a one standard deviation increase in reading leads to a 0.45 standard deviation increase in the score on the first canonical variate for the COVARIATE set when the other variables in the model are held constant. As in the case of multivariate regression, MANOVA and so on, for valid inference, canonical correlation analysis requires the multivariate normal and homogeneity of variance assumption. Canonical correlation analysis assumes a linear relationship between the canonical variates and each set of variables. Similar to multivariate regression, canonical correlation analysis requires a large sample size.